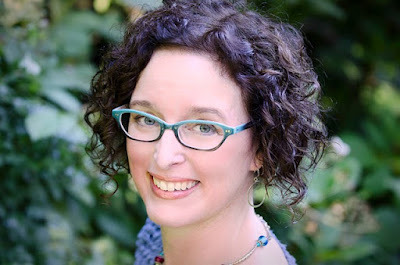 Cara asked if I (Jeff) would mind introducing her guest blogger this week, Lisa Alber. Little did Cara know that Lisa and I have a loooonnng history together. One that always makes me smile when I think about it…and there are very few folks I can say that about. :-) You see, back when Lisa published her debut novel, Kilmoon, and appeared on her very first author panel (at Left Coast Crime in Monterey), guess who was her moderator. Yep, moi. And I enjoyed it so much that a couple of years later I popped up again as her moderator on another panel. So, folks, I know of what I speak when I say Lisa is a truly gifted writer and delight to hang out with. Thanks for inviting me to join the gang for a day, Cara! For those who don’t know my novels, I represent the Republic of Ireland. 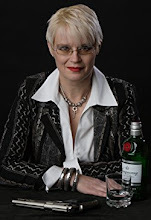 I’m a Yank from Californian, with Irish blood, and I chose to set my first three novels in Ireland because a novel idea found me the first time I traveled to Ireland. I should say, a workable idea that excited me found me. 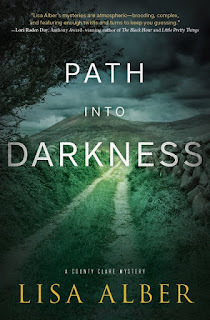 From there, I started a mystery series set in County Clare. 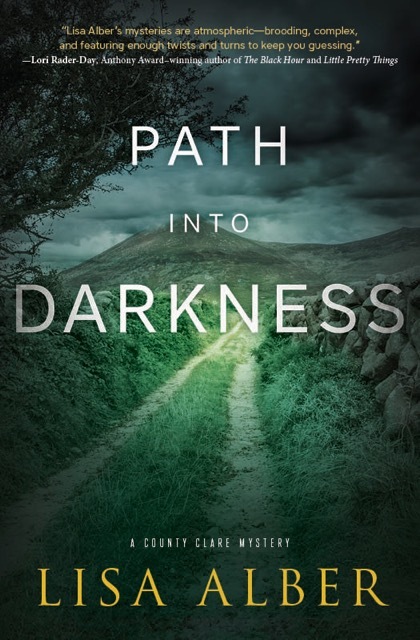 The third novel, Path Into Darkness, comes out in August. The title of this post comes from the novel. Memory as a slippery mistress is a theme for one of my more troubled characters, Nathan. He can’t trust his memories—can’t be sure they’re the truth. Memory isn’t truth, anyhow, but we tend to think of them as the truth about past experiences, don’t we? This came home to me last year when I traveled to Ireland for the first time in a decade. 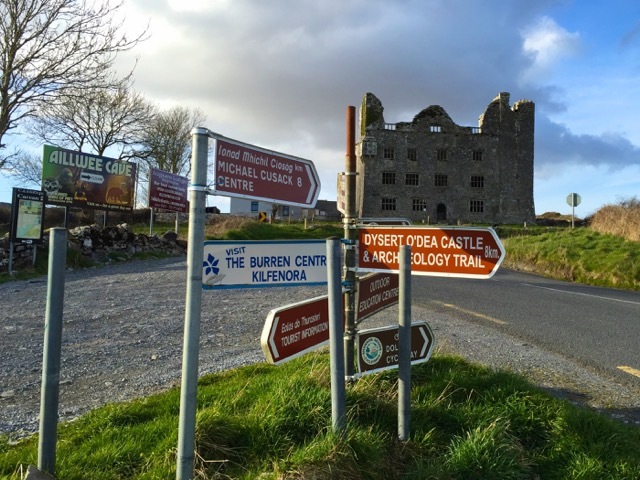 My first twenty-four hours in County Clare, driving around, reacquainting myself with old haunts and routes, were an exercise in disillusionment and righteous indignation. There I was, expecting the march of progress to bypass County Clare. Hah! The wild and wooly nature of the area is definitely on the decline. Tourist signage everywhere shortened distances. New housing lining the roads between villages felt more suburban than rural. The narrow roads between villages were widened and—gasp!—actually painted with dotted white lines to keep drivers civilized. Gotta tell you, I missed barreling along just shy of head-on collisions and every once in a while pulling onto a verge to allow a truck to pass. … gorgeous except dismayed by my lying memories and the changes – so many more houses. 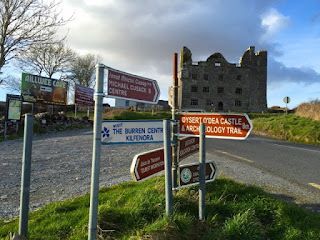 The vast expanses of fields and narrow, unlined lanes not so much anymore … I realized that my disillusionment at seeing Clare again stems in large part from living with my fictional Clare for so long – it had become reality. In other words, I realized that I wasn’t just once removed from reality through memory. 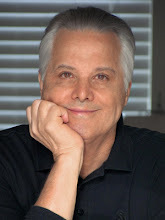 I was twice removed – from memory to fiction. My fictional Clare had become more real to me than reality, more real than my memories even. No wonder I was disoriented and resentful at first. Hold the phone, this isn’t Clare! No, what it wasn’t was the land of my novels. I use fictional license, as we all do, highlighting some aspects of my location, not mentioning other aspects that aren’t important to the story. What amazed me was how well my brain erased those other aspects—like the ugly rock quarries, for example, and the sad mud-coated donkeys forgotten in their pastures. Between the old stuff that I’d conveniently forgotten and the new changes, I didn’t recognized Clare at first. HOWever, after the first few days, I was back to loving Clare and eager to experience it objectively and with an open heart. I needed the dose of reality, and, in the end, an ugly rock quarry and a housing development and a tourist cottage made appearances in Path Into Darkness. On a deeper level, my experience helped me deepen Nathan, which helped shape the story. If my brain could erase reality so easily, what about people with actual traumas in their backgrounds? I don’t know the answers, but it’s the kind of question I like to play with in my stories. Have you ever gone to a beloved place years later and felt it was diminished somehow? Yes, the town I grew up in (pop. 3000 at the time). I've been going back regularly for 40-some years (family still lives there), but the town is now over 10,000, has 1-way streets, almost all the old businesses gone, the people I knew gone (or changed beyond recognition or names simply forgotten). If I didn't know better I'd think my name was something crazy... like Jeff. Hi Everett, great to be here! That's the weirdest feeling, that's for sure. My hometown is pretty much the same (purposefully--to keep it quaint) yet when I go back it feels odds. The shops are upscale and gentrified now, and everyone looks like they came out of the fancy catalog. I still remember the head shop and ice cream parlor! Welcome, Lisa. It's great to see you here. For me, that moment came when the elegant, traditional shops along the Via Calzaiuoli in Florence were gone and there was a Footlocker and a Disney Store in their place. Ugh! But, like yours, my heart accommodates to the new reality and remains in love with the place as it is and the way it endures in my memory. Hi Annamaria! The inevitable American cultural imperialism as work. Yuck! I get sad when that happens in my city (Portland, OR)--as soon as a Starbuck's enters a funky, eclectic neighborhood, that's it, all the fun is about to go out of it. Silverton! I totally get what you mean about the changes there. The last time I visited, I was surprised. I still love Silverton, though -- must have been a great place to grow up! It WAS a great place to grow up. But, oh lordy, has it changed since the late 50s, early 60s. But then, haven't we all...? It's still like driving back into a fun-house full of warped mirrors, every time we go there. Familiar, and yet VERY different, like you're in a dream and a place you know has been blended with a half-dozen unrelated places you've been. I should read this series, set in Ireland. Being as how I spent the first six years of my life in the West Village in NYC, I see that it hasn't changed that much. Perhaps more stores and a few tenements on my block were renovated. But it still looks the same. Fire! Why can't we learn from the past? The UK going to the polls. Again. Super- Recognisers and the Sewers Of Mexico City.